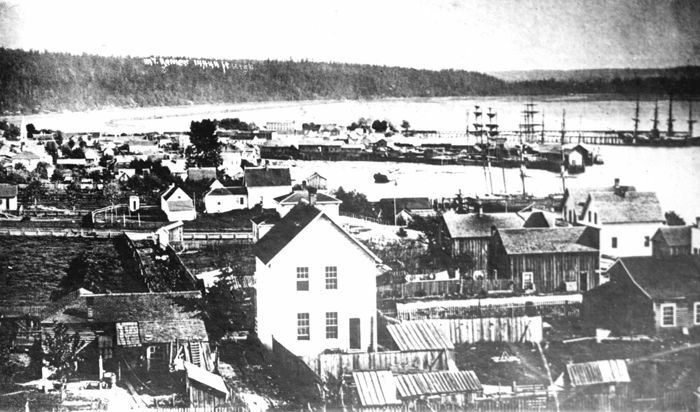 In February 1852, a group of settlers founded the city of Seattle, Washington on the shores of Puget Sound. They chose the location because it provided a good place from which to ship logs and timber south to San Francisco, California. The following year, a steam sawmill was built, and with it, Seattle’s first industry was born. The town grew slowly at first due to its isolated location and the nation’s involvement in the Civil War. This isolation ended in the late 1880s and early 1890s when the Northern Pacific and Great Northern railroads crossed the Cascade Mountain range into Puget Sound. During this period, Seattle began to enjoy economic prosperity as a hub for shipping and railroads. 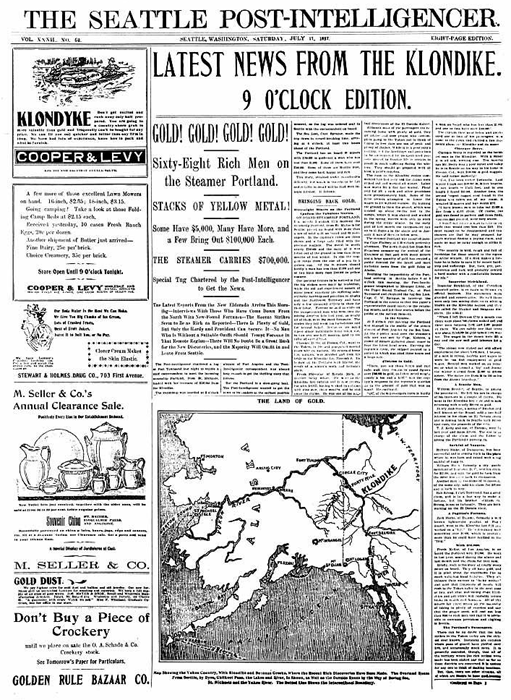 Seattle buzzed with excitement on July 17, 1897, when word came over the telegraph wires two days earlier that the S.S. Portland was heading into Puget Sound from St. Michael, Alaska, with more than a ton of gold in her hold. The gold strike had begun quietly on August 17, 1896, when three miners found gold in the Klondike River, a tributary of the Yukon. News of the strike spread slowly over the next year until miners began to return with their fortunes. On board the Portland were 68 miners and their stores of gold. The local newspaper, the Seattle Post-Intelligencer, sent reporters on a tugboat to interview the miners before they docked along the Seattle waterfront. Excited by the promise of catching a glimpse of gold, 5,000 people came down to the docks to see the miners and their treasure. The crowd was not disappointed. As the miners made their way down the gangplank, they hired spectators to help unload their gold. In a matter of hours, Seattle was swept with a case of gold fever. 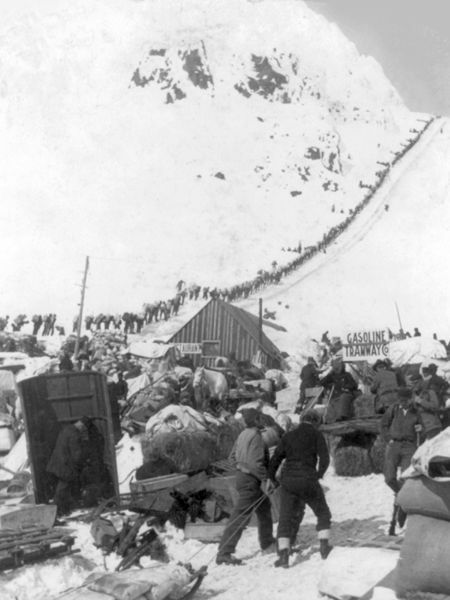 The great Klondike Gold Rush in Yukon Territory was on, as people dropped everything to head for the gold fields. Seattle’s Pioneer Square, the area of the town’s first settlement, welcomed thousands of prospective miners, known as “stampeders.” Merchants and ticket agents were beset with stampeders anxious to find transportation to the gold fields and to purchase supplies called “outfits.” Store owners quickly stocked up with goods the prospectors would need and urged them to take advantage of their competitive prices. On average, an outfit for two people cost $250 to $500 and included such items as heavy clothing and boots; nonperishable foods like smoked bacon, beans, rice, and dried fruit; personal items like soap and razor blades; and mining tools. Stampeders had to buy enough supplies to last for several months because there were few, if any, opportunities to replenish supplies on the way to the gold fields. By early September, 9,000 people and 3,600 tons of freight had left Seattle for the Klondike. Seattle became a temporary home to thousands of people as they feverishly planned their trip north. Steamers taking passengers to Alaska were overbooked and often dangerously overcrowded. Even so, many people who came to Seattle were forced to wait weeks before space became available at all. Merchants welcomed the flood tide of customers to the city, but hotel rooms and boardinghouses became scarce. Whether arriving by boat or train, newcomers flocked to Pioneer Square to find a bed. Spare rooms, basements, and attics were converted to living quarters for stampeders awaiting transportation to Skagway, Alaska and other points north. Pioneer Square offered filling meals and many amusements for those who had the time or the money to spare. Hungry stampeders could purchase a meal at one of the many restaurants, cafes, and eateries throughout the business district. Gambling halls, variety theaters, and saloons catered to the whims of many. Adding to the neighborhood’s rough-and-tumble reputation, some dishonest people sold prospectors goods they did not need or substituted poor quality food for the better quality items the stampeders thought they were purchasing. One of the immediate concerns of the stampeders was the route they would take to the gold fields. Few had any idea of how far they would have to travel after they left Seattle. 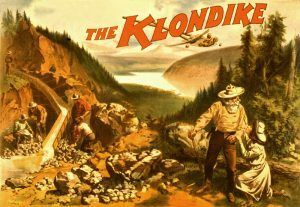 Many were astonished to find that the Klondike strike was not in Alaska but across the Canadian border into the Yukon Territory. 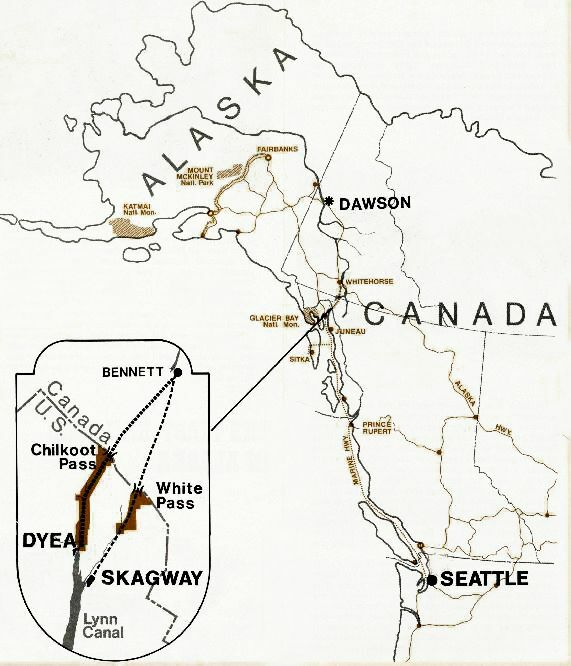 Since many of the prospectors were poor, they had to take the less expensive but extremely difficult route up to the Alaskan panhandle and over mountains to the Yukon River and then to Dawson, the town closest to the gold fields. 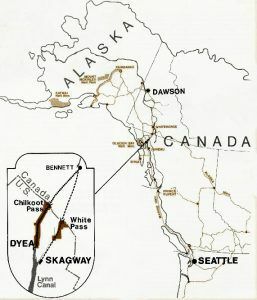 Those who could afford the easier, all-water route, traveled to the delta of the Yukon River and then down the river to Dawson City. Most stampeders who set out in the fall would not even reach the gold fields until the following spring because the Yukon River had frozen and the mountain trails from Skagway and Dyea, Alaska, were almost impassable. Most would return to Seattle in a year or two — some with riches, but most poorer than when they started. Others died before ever seeing the gold fields. Soon after the news of the Klondike gold strike was out, other port cities on the Pacific coast — especially Tacoma, Washington, and Portland, Oregon — were eager to attract the business of stampeders. Erastus Brainerd, hired by Seattle’s Chamber of Commerce to publicize the city’s resources, founded the Bureau of Information to answer questions about outfitting, transportation, and accommodations. The following statistics are from a report he issued to show the Bureau’s progress in advertising the benefits of outfitting in Seattle. The Klondike gold strike in the Yukon Territory marked the end of an era when prospectors could hope to dig out a fortune from the earth. Perhaps because it came so late in time compared to other major gold strikes, or perhaps because some miners did take home millions in spite of the frozen environment, this gold rush left a lasting mark on the American imagination. Today, readers still enjoy The Spell of the Yukon, by Robert Service and the many works of Jack London such as Call of the Wild and White Fang, that tell of the immense hardships under which the miners worked. Yet these stories also tell of the pull that the far north had on many and, even today, they spark readers’ fascination. The Klondike Gold Rush was significant not only because it was the last great gold rush but also because it increased awareness of the northern frontiers of Alaska and Canada. 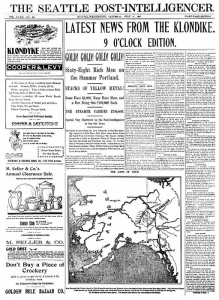 Unimpressed, the press had labeled the purchase of Alaska as “Seward’s folly” or “Seward’s icebox.” Alaska and the Canadian Northwest, including the Yukon Territory, remained sparsely populated until the end of the century. When the U.S. Census Bureau declared the western frontier closed in 1890, interest in Alaska grew. While there still were millions of acres of empty space in the lower states and territories, more people began to venture north, toward the lands they recognized as the last frontier. The discovery of gold, first in Yukon Territory and then in Nome, Alaska, raised the public’s interest in what the far north had to offer. Many changes took place in the Yukon as a result of the gold rush. A railway was built from Skagway, Alaska, to Whitehorse, Yukon Territory, in 1900. The population of Whitehorse swelled to 30,000 the same year. 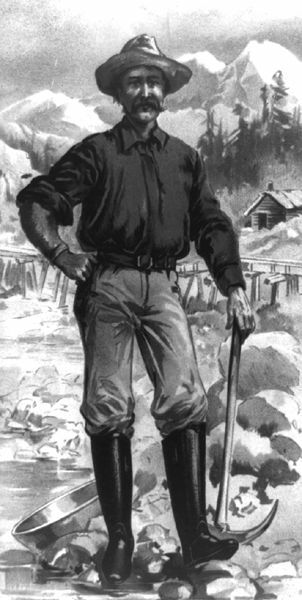 The gold-bearing gravel found between the Yukon and Klondike Rivers brought as much as $22 million in 1900, but it fell to $5.6 million by 1910 when most of the prospectors had left for Alaska, returned to Seattle, or set out to other regions. Many of the stampeders who went through Seattle never reached the gold fields. In fact, between 1897 and 1900, more than 100,000 people from many nations attempted to reach the Klondike, but no more than 40,000 reached Dawson City. Some quit on the trail after experiencing too much hardship. Some returned to their original homes. Still, others returned to Seattle and made it their permanent home. The city had many attractions and rewards for those who decided to stay, but the primary lure was the wealth of jobs for the unemployed. Merchants hired clerks and stockers to keep up with the rising demand for goods and services. Local manufacturers of equipment and clothing, food processors, and shipyards all needed workers, as well. Even the government of the City of Seattle was hiring because city workers and police officers were needed to replace those who had quit and gone north in search of gold. 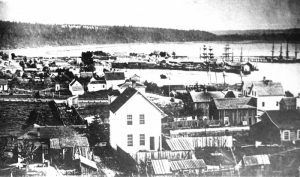 For Seattle, the gold rush created a boom that attracted people from all over the world even after the gold rush ended. In 1890, Seattle’s population was 42,837. By the turn of the century, that figure had almost doubled, and by 1910, the population had reached 237,194. Matching this growth in population was an expansion of the city boundaries. 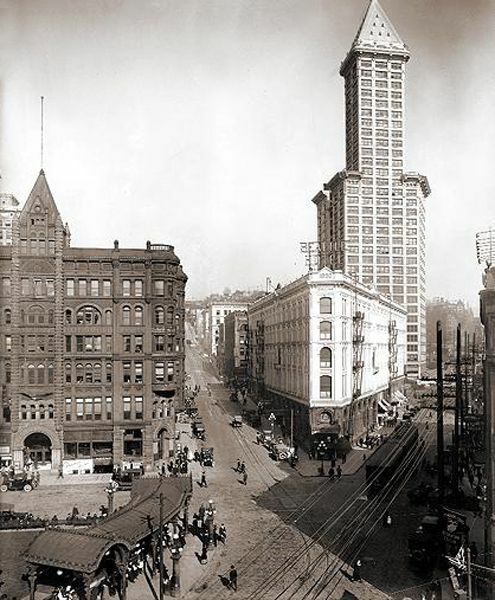 By annexing small areas to the north and east of Pioneer Square, the size of the city more than doubled by 1910. Seattle’s business community continued to flourish. Many miners who returned to Seattle invested their fortunes in local businesses. For example, John Nordstrom invested $13,000 of Klondike gold into a shoe store, owned by a cobbler he had met in the gold fields. That shoe store marked the beginning of the Nordstrom department store chain. Outfitters, such as Edward Nordoff of Bon Marche, were able to capitalize on their successes during the gold rush and transform their small storefronts into major department stores that now have branches in many cities. Seattle’s links with the West Coast and the rest of the country continued to improve its economy. Manufactured goods, timber products, and other natural resources could be shipped by sea to San Francisco, Alaska, and the countries along the Pacific Rim. Goods also could be shipped by rail, with direct connections to Canada, California, the Midwest and the Northeast. At the dawn of a new century, Seattle had established itself as the premier city of the Northwest. Compiled & edited by Kathy Weiser/Legends of America, updated November 2018.